"Ninon Vallin…an exceptionally cultured artist [who] made a considerable impression….I was enchanted by the delicacy of her vocal colouring…." 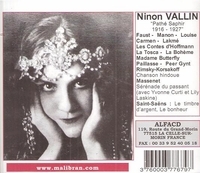 "Ninon Vallin was without doubt the most completely recorded of all major French singers of the first half of the twentieth century. She was born Eugénie Vallin in Montalieu-Vercieu not far from Lyon on or about 7 September 1886, and died near Lyon on 22 November 1961. She studied music at the Conservatoire in Lyon for three years and continued at the Conservatoire Fémina-Musica with Meyrianne Héglon. Her legacy is enhanced by the fact that her recording career paralleled her appearances on stage and the concert platform. The Record Collector (volume 48, #2, 2003) provides a comprehensive discography and much hitherto unknown material on her career, so the remarks here merely draw attention to the close relationship between her stage career and recordings. Vallin’s début at the Opéra-Comique in 1912 was as Micaëla in CARMEN, whose third act aria she recorded in 1921, and the duet ‘Parle-moi de ma mere’ in 1934 with Miguel Villabella. In 1926, during her second Opéra-Comique period, Vallin appeared more frequently in the title rôle, subsequently singing it often both in France and abroad. She recorded extensive extracts of CARMEN, both solos and duets, mostly electric recordings. MIGNON was added to Vallin’s repertoire during her initial Opéra-Comique season, the first of the rôles tending towards the mezzo end of the soprano range, which particularly suited her voice. She remained associated with the rôle of Mignon, and was chosen to sing the feted 1600th performance at the Opéra-Comique in 1927. She recorded two versions of ‘Connais-tu le pays?’, both duets with Lothario, and ‘Elle est aimée’, though she never committed the Styrienne to wax. Louise, a rôle first assumed by Vallin in 1914, played an important part in her stage and recording career. She recorded ‘Depuis le jour’ on six occasions, and sang the title rôle in Columbia’s 1935 abridged recording of the opera. Mimi in LA BOHÈME was also one of Vallin’s major rôles, sung in French for the Opéra-Comique performances and in Italian for those in South America. Mimi’s entrance and farewell were recorded in several versions (all in French), and in 1932, Vallin recorded the quartet and extracts from the final scene with Villabella. She twice recorded Musetta’s waltz, though there is no evidence she ever sang the rôle on stage. Manon, a rôle she assumed in 1915, was to be even more important for Vallin, as she sang it in France and both North and South America throughout most of her career. Sadly, there is no complete recording, but she did commit to wax all the arias and most of the duets save the finale. Charlotte in WERTHER, another rôle midway between soprano and mezzo, fared better, as there is the 1932 complete recording with Georges Thill, as well as many extracts recorded in the years between the wars. Vallin remained at the Opéra-Comique until disagreement with the manager, Pierre-Barthélemy Gheusi forced her to leave in 1915. She sang extensively in Latin America, then returning to Paris, though this time to the Opéra for her first THAÏS in 1920, quickly adding the two Marguerites (FAUST and LA DAMNATION DE FAUST), before her career there came to an abrupt end, followed by another stint in Latin America. Berlioz’s Marguerite is represented by an abbreviated version of the two arias in a recording from the period of her Opéra appearances and in more substantial extracts recorded at the end of her career in 1955. Gounod’s Marguerite is represented by the two famous arias recorded in several versions, and the garden and church scenes recorded in 1930. Vallin’s return to the Opéra-Comique in 1924 featured her as Louise, while the following year, she again sang both Marguerites at the Opéra. She toured France and the world in subsequent years, with concerts taking up more of her activity than opera. Her repertoire of French and Spanish songs are well represented on disc, though there is little of the Debussy with which she was associated at the beginning of her career."